Facing Miller Park at the intersection of Pratt and Morris avenues, The Colonnade was the business center of Chautauqua Institution. 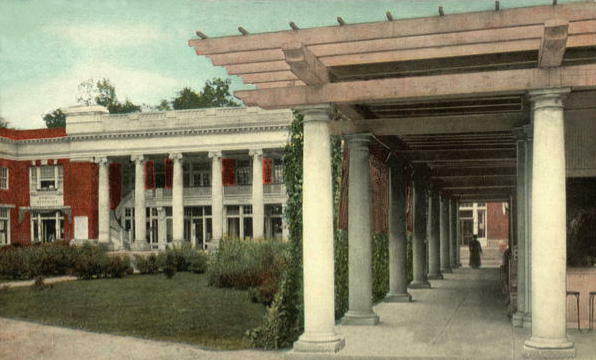 The Colonnade as it appeared in 1909. You can see the vine-covered pergola on the right. Visitors approaching The Colonnade from the south passed through a lovely, vine-covered pergola. The pergola with The Colonnade beyond it and to the left. The Colonnade was a busy place. Nearby was the post office, where residents retrieved and sent mail. 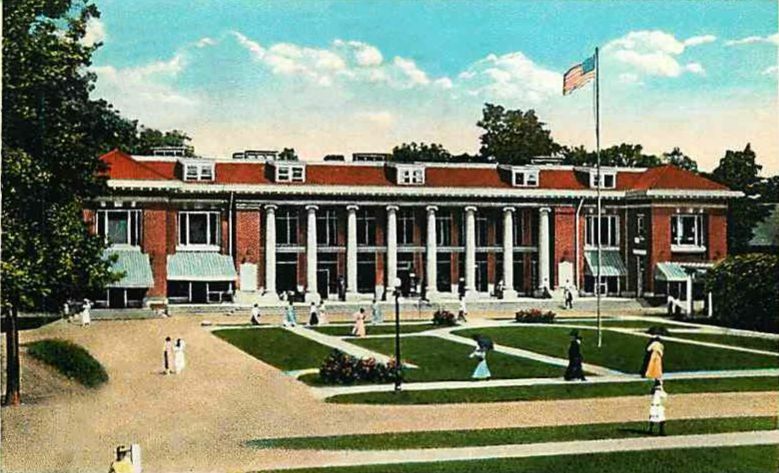 The Colonnade itself was a favorite place for friends to gather. It housed a grocery, a dry-goods store, a hair salon, a barber shop, a drug store, and various other merchants. One retailer that managed to secure a prime location in The Colonnade was an establishment called Spirella Parlour, which was a genteel store name for the Spirella Corset Company. 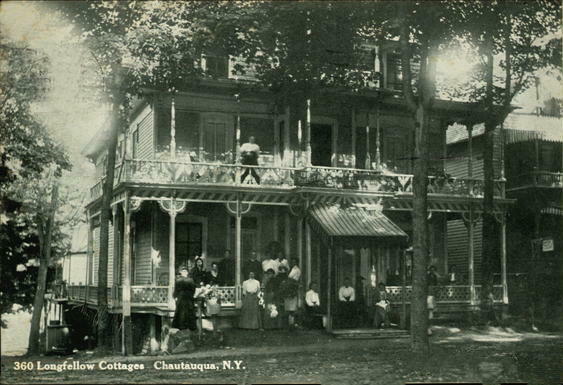 A Chautauqua post card modified by the Spirella Corset Company to show the location of their shop at The Colonnade, Chautauqua, New York. 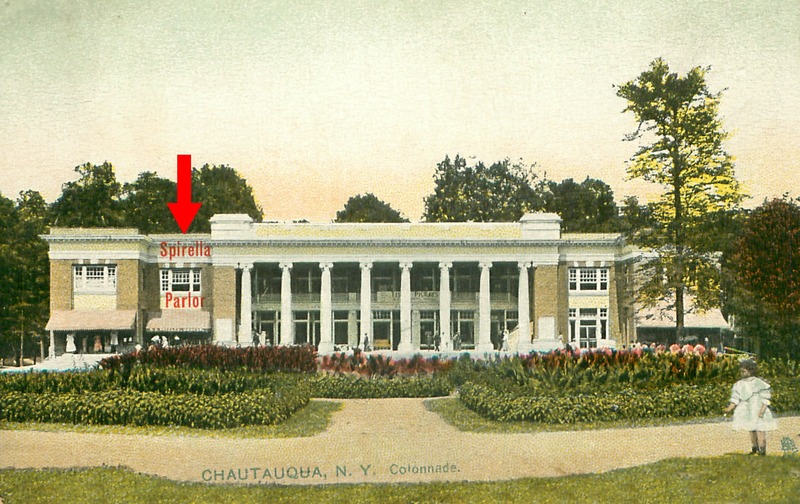 The Spirella Corset Company had factories established in Pennsylvania and Canada when they set up shop in The Colonnade at Chautauqua. Wedged between a ladies’ dress shop on one side and the main hall, their’s was an ideal location. The store was staffed by “skillful corsetières” (more on them in a moment). 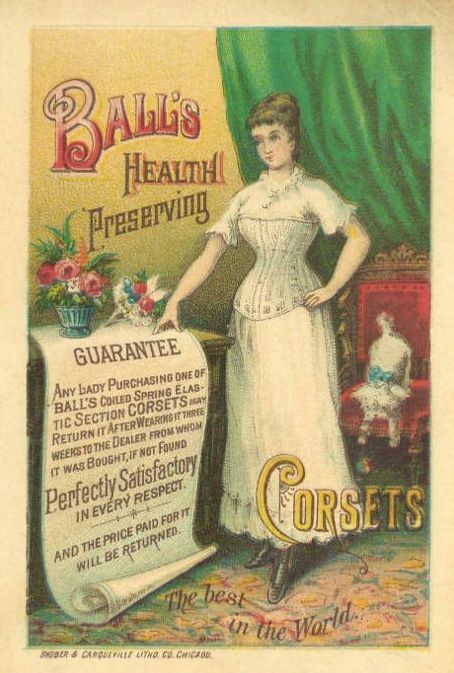 A trade card for Ball’s “health preserving” corsets, from about 1880. In Isabella’s time, every woman—and many girls—wore corsets. They were an essential element of a lady’s undergarments. 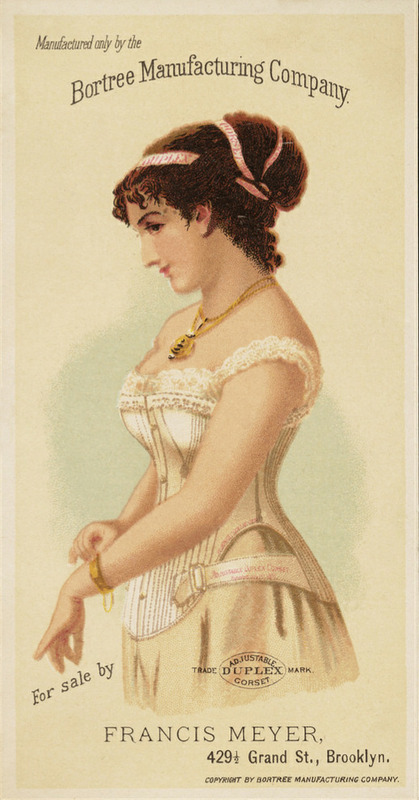 Trade card for the Bortree Adjustable Duplex Corset by Bortree Manufacturing Company, about 1890. But corsets did not last very long. Their stays had a tendency to break; and since corsets were worn over only a thin muslin chemise or slip, perspiration and natural skin oils often stained the corset fabric or rusted the stays. Magazine ad for Warner’s corsets, about 1917. Corset garter hooks often broke, and their long lacing ribbons often snapped off. 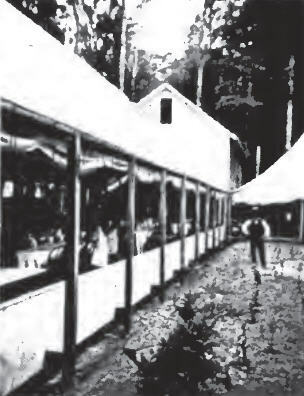 For women, access to a store such as Spirella’s on Chautauqua’s premises was practically essential, since the nearest town where a lingerie store might be found was miles away. 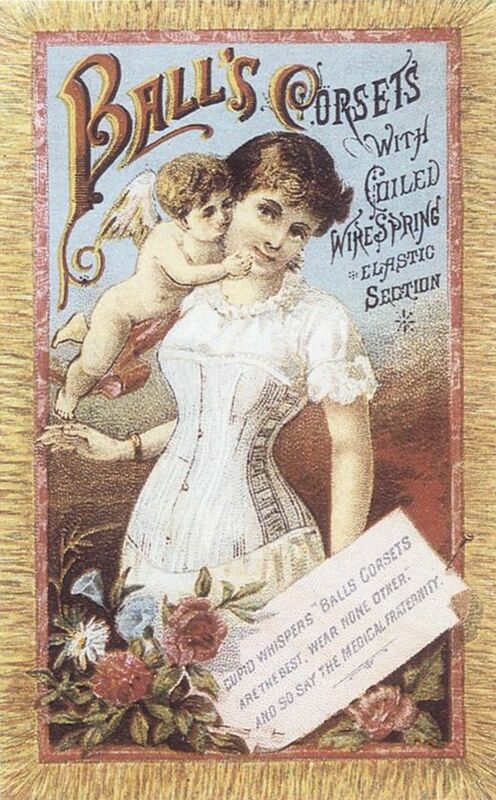 Trade card for Dr. Strong’s Tampico Corset. Over all of that she donned her dress or skirt with shirtwaist. Doctor and Madame Strong brand corsets touted the medical benefits of wearing their corsets. 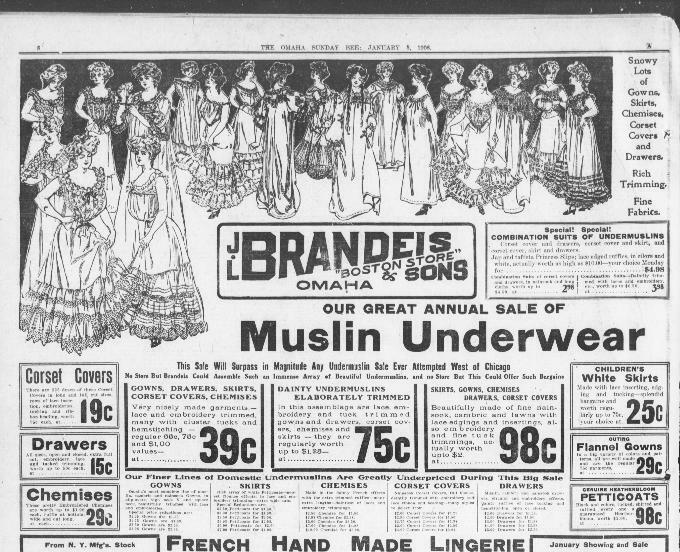 This 1908 newspaper ad in the Omaha Daily Bee shows some of the many different undergarments women wore under their clothes. A woman’s corset was essential; she wore a corset wherever she went, no matter what she was doing. Of course, The Spirella Company was not the only corset manufacturer in the United States. There were many such companies, each vying for their share of the corset market. 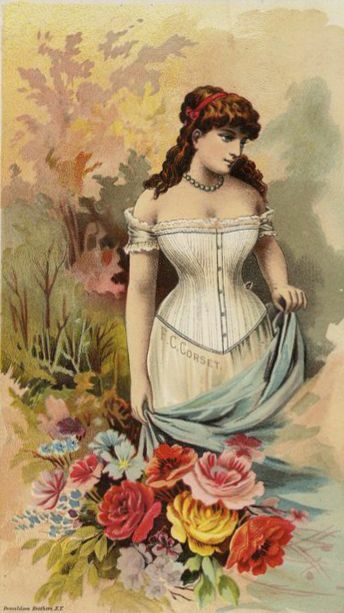 F. C. Corset Company trade card from about 1890. What set Spirella apart from their competition was that they specialized in custom-made corsets. In fact, the Spirella Parlour at Chautauqua is the only known retail location for Spirella Corsets in America. Instead of opening stores, The Spirella Company hired a legion of women called corsetières who were sent to customers’ homes. The corsetières took the customer’s measurements and consulted on the correct model of Spirella corset based on the lady’s figure type. 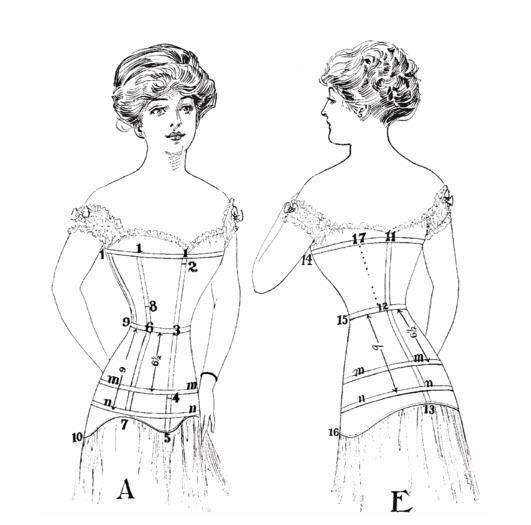 Spirella Corset Company diagram showing the many body measurements their corsetieres took in order to achieve a perfect fit. You can see The Spirella Corset Company’s 1913 brochure distributed by their corsetières to customers. The booklet is filled with nice illustrations of the different models of corsets they offered, and offers guidance on how to select the proper corset based on body type. Just click here.
. . . as essential as a corset was to every woman’s wardrobe, Isabella never mentioned corsets in any of her many books and stories. She did mention shifts and petticoats, but never made mention of corsets. 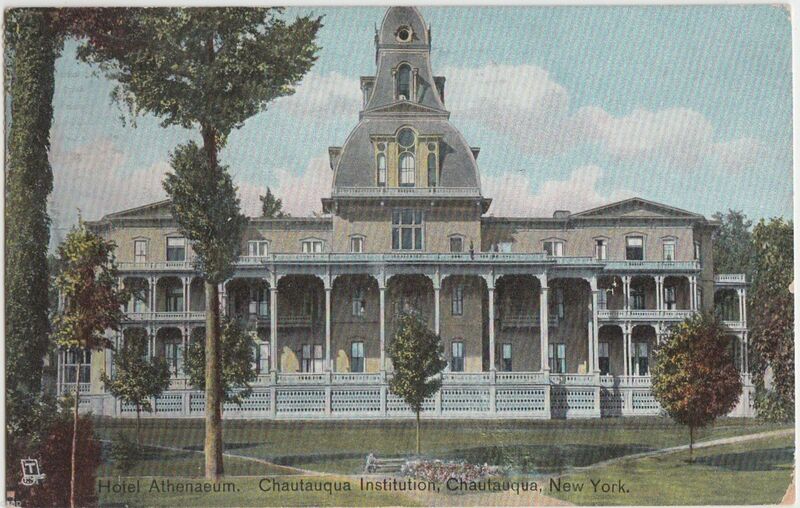 In the early days of Chautauqua, there were no hotels or boarding houses where visitors could stay. Instead, visitors rented tents or small cottages erected on the grounds. Some cottagers with room to spare rented out rooms to paying guests, but Chautauqua rules prohibited anyone from providing meals for pay. If you were not lucky enough to have a kitchen of your own in which to prepare your meals, you had to eat in the dining-hall, which was a long, open-air building furnished with rough, unpainted tables and benches. Visitors often complained that the roof leaked and the backless benches were uncomfortable, but the dining hall was the only place visitors could have meals unless they prepared food themselves. It was a merry dinner, after all, eaten with steel forks and without napkins, and with plated spoons—if you were so fortunate as to secure one. The rush of people was very great, and, with their inconvenient accommodations, the process of serving was slow. Marion, her eyes being opened, went to studying the people about her. She found that courteous good-humor was the rule, and selfishness and ungraciousness the exception. Inconveniences were put up with and merrily laughed over by people who, from their dress and manners, could be accustomed to only the best. Ruth did not recover her equanimity. She was rasped on every side. Those two-tined steel forks were a positive sting to her. She shuddered as the steel touched her lips. She had no spoon at all, and she looked on in utter disgust while Eurie merrily stirred her tea with her fork. When the waiter came at last, with hearty apologies for keeping them waiting for their spoons, and the old gentleman said cordially, “All in good time. We shall not starve even if we get no spoons,” she curled her lip disdainfully, and murmured that she had always been accustomed to the conveniences of life, and found it somewhat difficult to do without them. 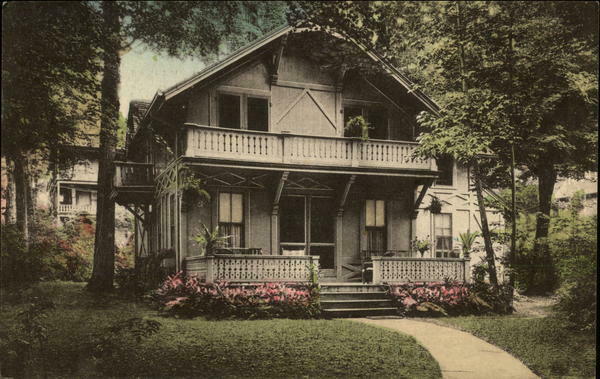 Chautauqua cottages along Miller Park in early 1920s. To the right, just out of view, is Chautauqua Lake. Before Mrs. Bradford’s table economies reached what Josephine called the “starvation point” a method of relief was discovered. It was learned that among the numerous boarding houses scattered over the grounds, certain of them furnished fairly good meals for twenty-five cents. They were named lunches, to be sure, but on occasion they would serve excellently well for dinners. Pencil and paper together with a vigorous exercise of Josephine’s computation powers proved that seventy-five cents would afford three of them better dinners than that sum would produce in the kitchenette. The Longfellow Cottage was a large boarding house. Centrally located on Roberts Avenue, it was only one block away from The Amphitheatre, the C.L.S.C. Building, the Children’s Temple,the Administration Building, The Colonnade and the Post Office (which will be featured in the next leg of our tour). In 1881 the Palace Hotel was replaced by The Athenaeum, a proper hotel that featured elegant accommodations and beautiful views of the lake. As the Athenaeum attracted more guests, the cottages and boarding houses grew in number, size and comfort in order to compete for their share of paying boarders. 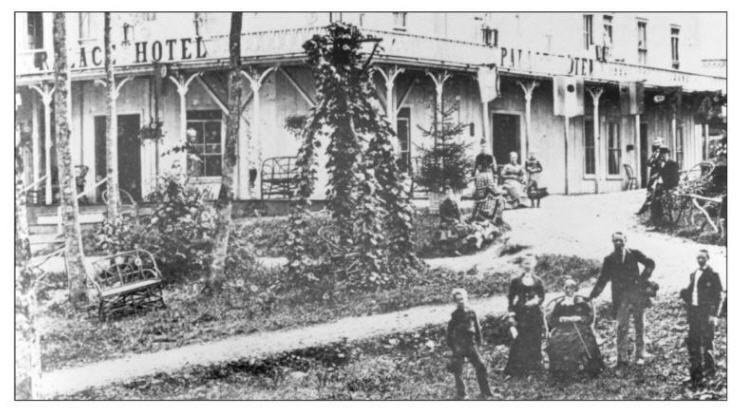 The Hotel Athenaeum as it looked in 1908. The hotel is still in use today. 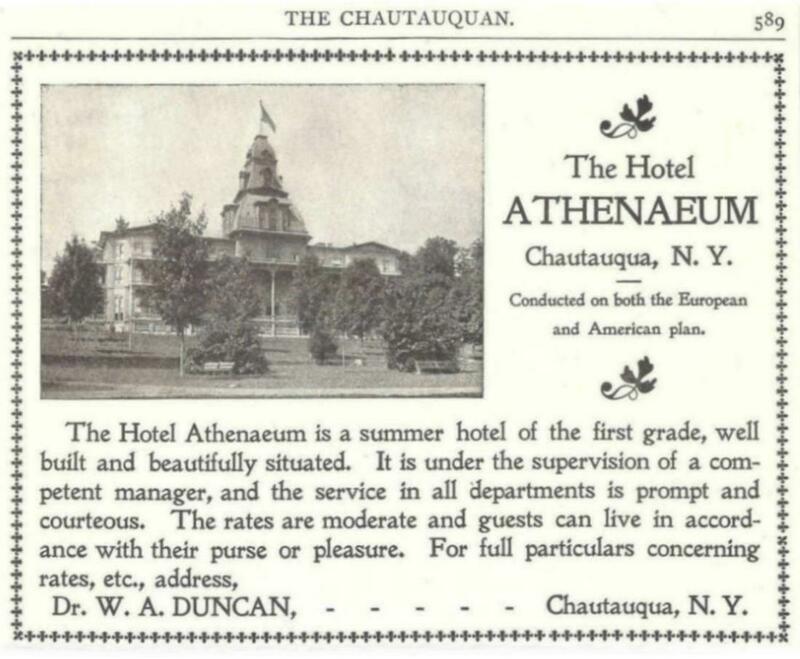 When the Four Mothers returned to Chautauqua with their children and grandchildren, they stayed at a hotel that sounded very much like The Athenaeum. 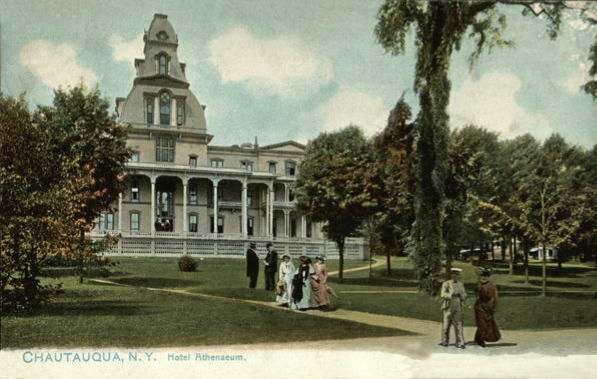 Isabella Alden set many scenes on the hotel’s upper and lower verandas and her characters made great use of the lush lawns that led from the hotel down to the lake. 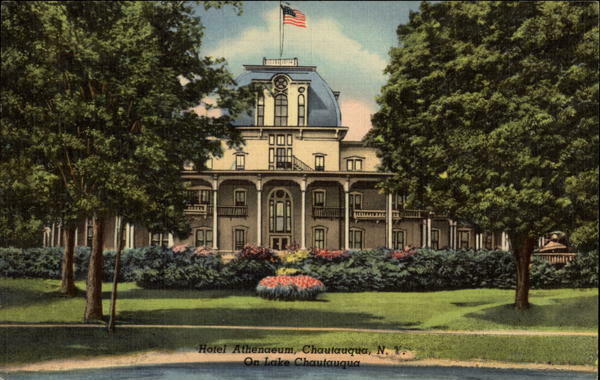 This image of The Hotel Athenaeum and its verandas is dated 1911, just two years before Four Mothers at Chautauqua was published. 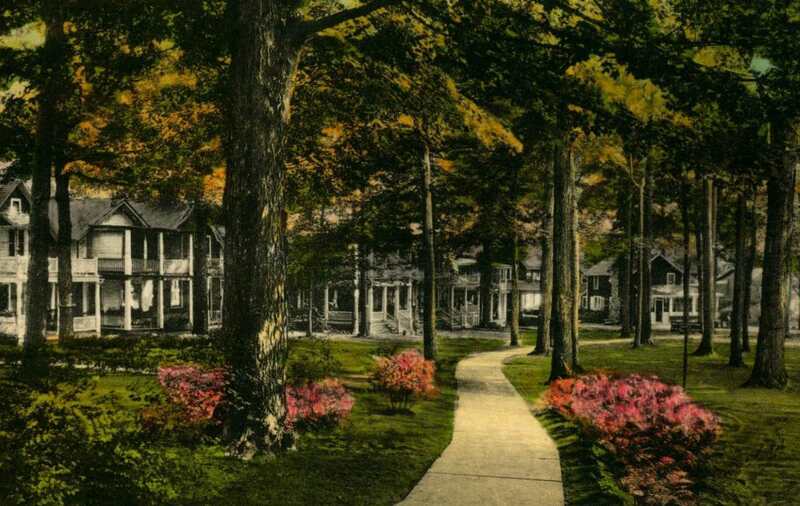 Visitors to Chautauqua used a Handbook of Information to locate places to stay. 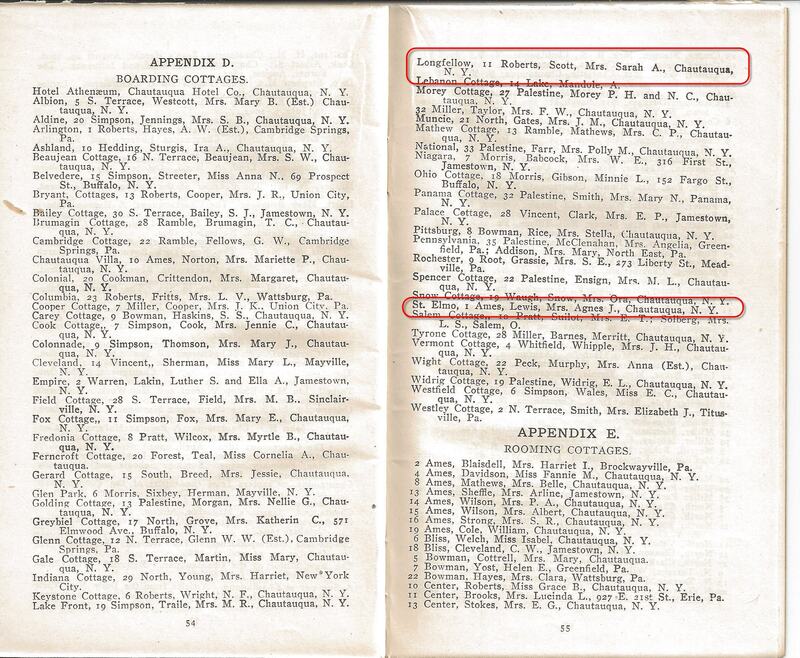 These sample pages from the 1908 Handbook list hotels and boarding houses on the grounds, their addresses, and the owners of the establishments. 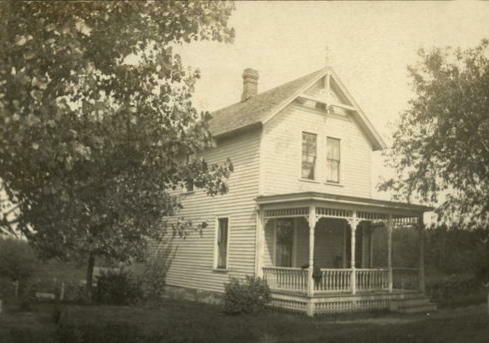 The Longfellow boarding house (pictured earlier in this post) is listed on the top of the second page. 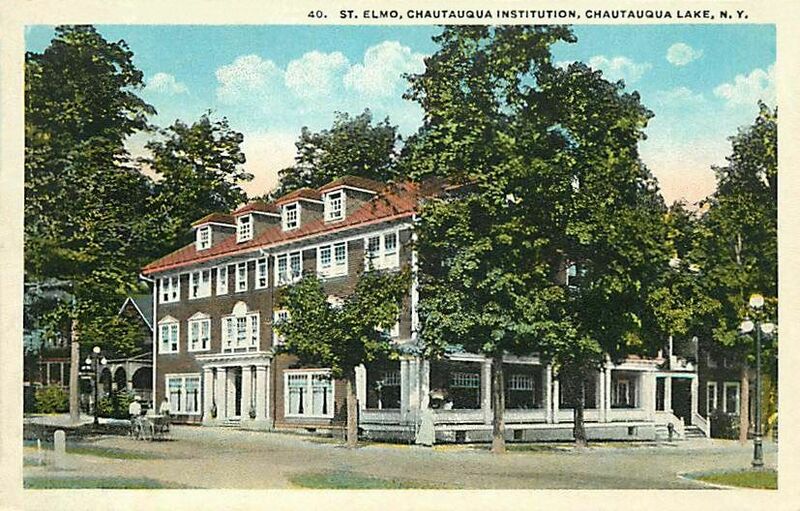 The St. Elmo was another hotel on the Chautauqua Institution grounds that was listed in the 1908 Handbook. Here’s how The St. Elmo looked in 1920, as it stood at the corner of Ames and Pratt Avenues. With all the boarding and hotel options, tent living still thrived. 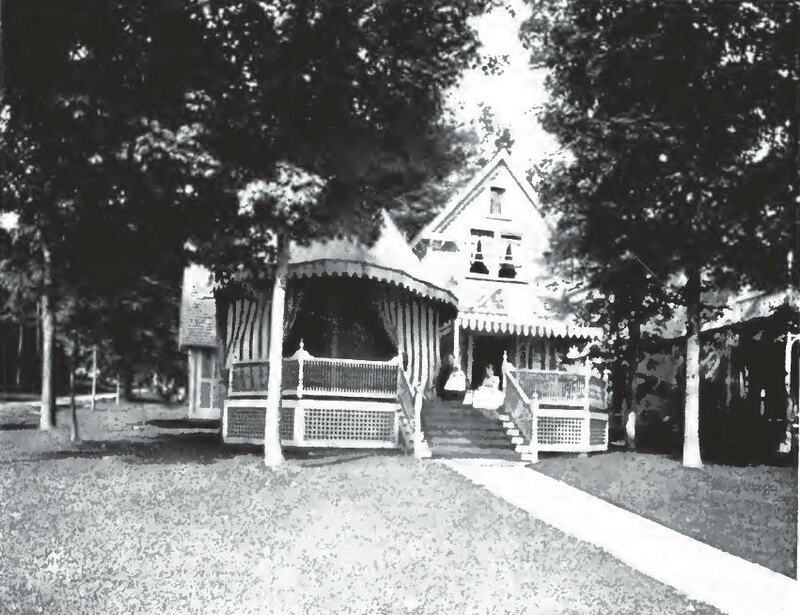 Chautauqua’s founders, John Heyl Vincent and Lewis Miller, maintained residences that were hybrids of cottage and tent. Lewis Miller’s cottage. 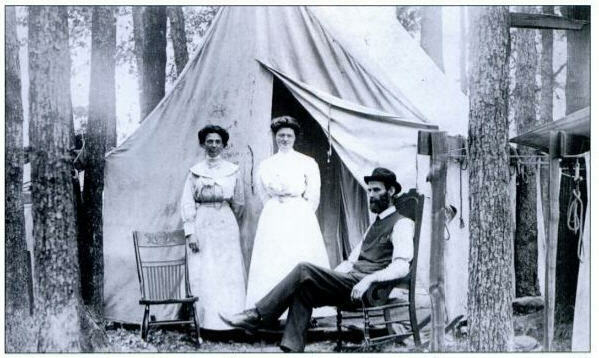 He accommodated overnight guests in a tent he erected on the lawn. 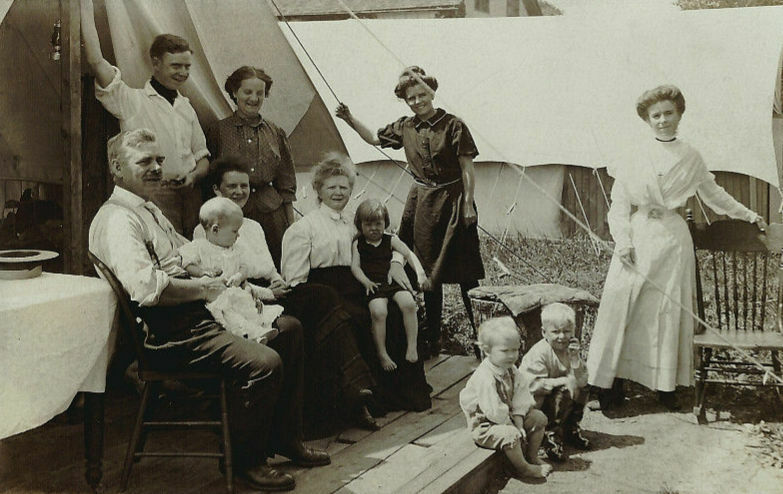 As Chautauqua grew and offered more and more styles of accommodations, many visitors still chose a simple summer of tent life in God’s great outdoors.